About the Client: The Community Foundation of Santa Cruz County is a non-profit that facilitates philanthropic efforts in the California central coast. 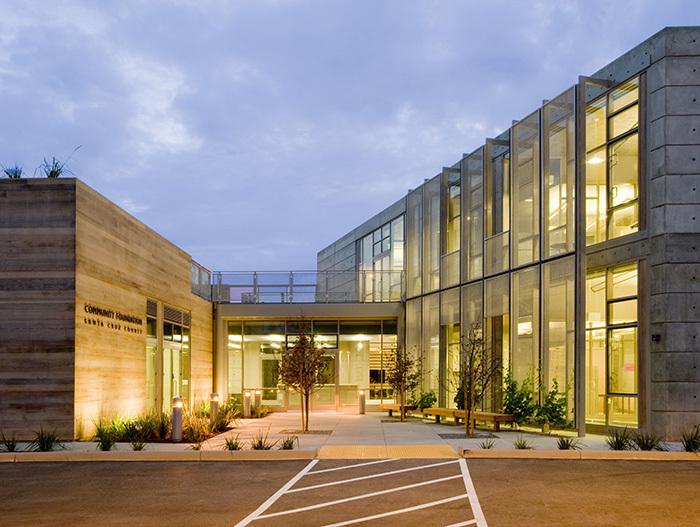 Serving a diverse, geographically long County, the Foundation selected a site centrally located in Aptos, California to construct a new, permanent headquarters as they outgrow their existing leased office space. Project Description: The project consists of a new, two-story, 10,000 square foot office building to house the Foundation’s administrative, development, program, and education operations. The building consists of two major structures linked with a bridge and surrounding a courtyard on a challenging, partially below grade site. In addition to new office space, the project includes conference space to support the Foundation’s efforts, as well as community meeting rooms and an outdoor rooftop function space. Special Features and Challenges: This new building seeks a minimum LEED NC Silver or Gold certification and includes primarily natural ventilation, low water and energy usage fixtures, significant daylighting and views, and rooftop photovoltaic panels. The space will prove efficient, sustainable, and comfortable for employees and visitors alike. Nova Partners’ Role: Nova Partners was retained as the project manager and managed all aspects of the budgeting, schedule, design, permitting, and bidding of the project. Nova is also providing complete construction management services as well as management of the furniture, audiovisual, and telecommunications integration to ensure the Foundation has a seamless transition into their exciting and highly functional new space.